Introducing a new segment we’re calling Beneficiary Spotlight, whereby we highlight one of our amazing partners and tell you about the work that they’re doing. FRC Reggie distributes fresh fruit and prepared meals to IINE in Chinatown. 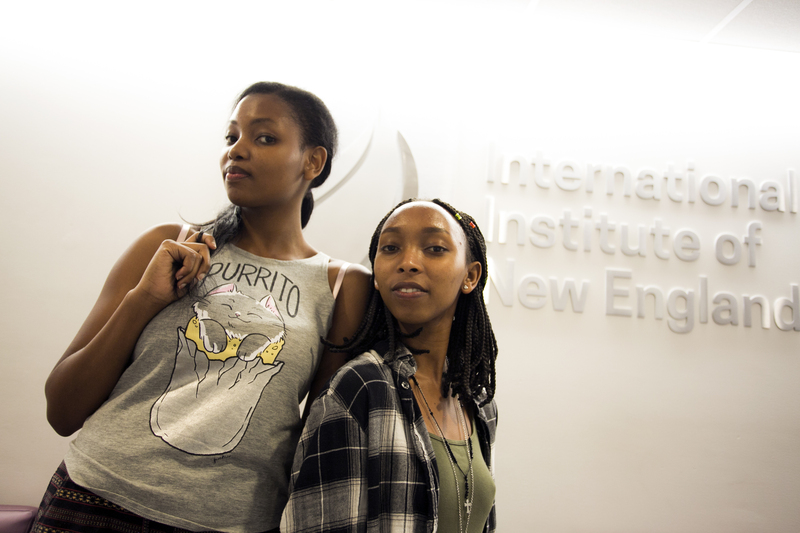 When you support Lovin’ Spoonfuls, you are supporting the International Institute of New England, which works hard each day to get thousands of immigrants and refugees the resources that they need. We spoke with Andrea Spake this month, who said the Lovin’ Spoonfuls gives IINE’s clients a chance to eat in between work and English classes. Spake, IINE’s Community Relations Manager, talks about the 100-year-old agency’s work. The International Institute of New England was founded in Lowell in 1918 by the YWCA. We have since expanded to three sites Boston, MA, Lowell, MA, and Manchester, NH. For 100 years we have been creating opportunities for refugees and immigrants to succeed through resettlement, education, career advancement and pathways to citizenship. Q: What types of programming do you provide? We provide a variety of services based on the needs of our clients. We provide everything from Refugee resettlement services, to English classes at a variety of levels, as well as skills training programs that help to train our clients for job upgrades. This past year we even expanded our services to provide more English classes as a part of our Adult Continuing Education program as well as added legal forms services. These two programs were added after an assessment was done to determine gaps in services provided across New England. Q: Can you tell us a little about the people you serve? In 2017 IINE helped nearly 2,000 refugees and immigrants from 66 countries including Syria, Afghanistan, Myanmar, Somalia, and the Democratic Republic of Congo. Our community is made of men, women, and children of all ages, ethnic backgrounds, and religions. We also have two staff members who have dedicated their careers to helping unaccompanied minors from Central America reunite with family members in the U.S. all across the East Coast. IINE is working to expand our services to double our reach to 4,000 individuals by 2025. Marie Ishimwe and Ange Cyuzuzo, two refugees from Rwanda, attend classes at IINE and have been living in the U.S. for 4 months. Q: Why is your work important right now? According to a United Nations report, there are currently 65.6 million people around the world who have been forced from their homes, of these 22.5 million are refugees. This is the highest level of displacement that has been recorded in human history. Over the generations, our response has remained consistent and constant: we provide an authentic welcome, orientation to U.S. culture, and support in obtaining the earliest and most basic needs of food, shelter, and clothing. Are services are offered through a continuum of support that meet our clients’ needs at every level. Q: How did you learn about Lovin’ Spoonfuls? When I entered this role the partnership between IINE and Lovin’ Spoonfuls had already been established. The first week of orientation I was informed of the fantastic support and quality of food that Lovin’ Spoonfuls provides our clients each week. Q: How has the partnership been helpful to your community? Often times our clients are splitting their time between work and English classes. This doesn’t leave a lot of time to go home a get a healthy meal or snack. When Lovin’ Spoonfuls makes their drop off it gives our clients a chance to grab a bite to eat. Working and studying as hard as they do takes a toll on their energy levels, so it is great to be able to offer a healthy option mid-day. Q: How can people support IINE? We would like to invite you to help us grow, expand, and continue to welcome the most vulnerable people on the planet. IINE depends on the support of our donors and volunteers to offer a high level of programming to our clients. We also encourage you to use your voice to advocate for new Americans. If you are interested in helping us please reach out to Andrea Spake at aspake@iine.org to hear about our current volunteer roles and opportunities to get involved.